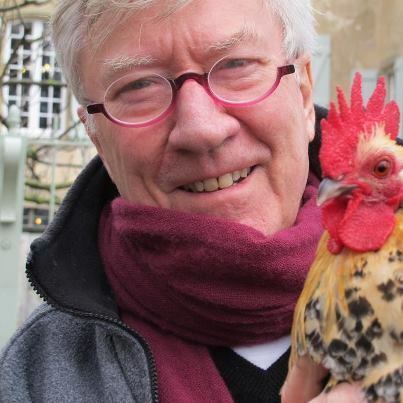 “Chickpea”–our friendly bantam–and I get re-acquainted. He’s keen to know what his American cousins are up to. “Are they early risers like me and Claude?” (our other cockerel). “Didn’t see–or HEAR for that matter–too many cockerels in downtown Washington D.C., Chickpea. Ha, good to see you safe back in la douce france dear Robin!! I think the cats and other animals will also be glad, hughs !! You can tell Chickpea that I live 3 miles from Washington, DC in Virginia, and I haven’t seen a rooster, but I have seen deer walking up my street. Bears have been seen around this area, too! I, too, live in Northern Virginia, and this past fawning season, I turned a corner near my neighborhood, and there was a tiny fawn tottering on 4 teeny-tiny legs, bleating for his mom. Luckily, he turned back into some shrubbery and met up with her (so I assume, as all bleating ceased). I had stopped my car and put on my flashers until the little guy was safe. Luckily for me, no one came zipping around that corner! What a dandy looking fella Chickpea is. You are so very lucky to have so many handsome & beautiful friends to call your own. What a delightful and original conversation! I’m so very happy and glad to learn that your voyage to the States was successful. on January 29, 2013 at 12:03 pm | Reply Dianne P.
Glad you ‘re back, safe & sound. So you spotted the raccoon outside of Kramerbooks, too! We could hardly believe our eyes when we saw it waddling down the street. Anyway, I wanted to say that meeting you and Meredith there a week ago Saturday was such a pleasure and I’m so grateful you provided the opportunity. This is a belated thank you for signing my three books and drawing, and for making meeting one of our all-time favorite actors.such an incredible experience for my twin sister Christy and me. It’s something we never expected to happen, and something we will never forget. And I’m glad you made it home safely to Chickpea! Pleasure meeting you both too Kathy–thanks for coming. Raccoons at noon must be rare as a blue moon!